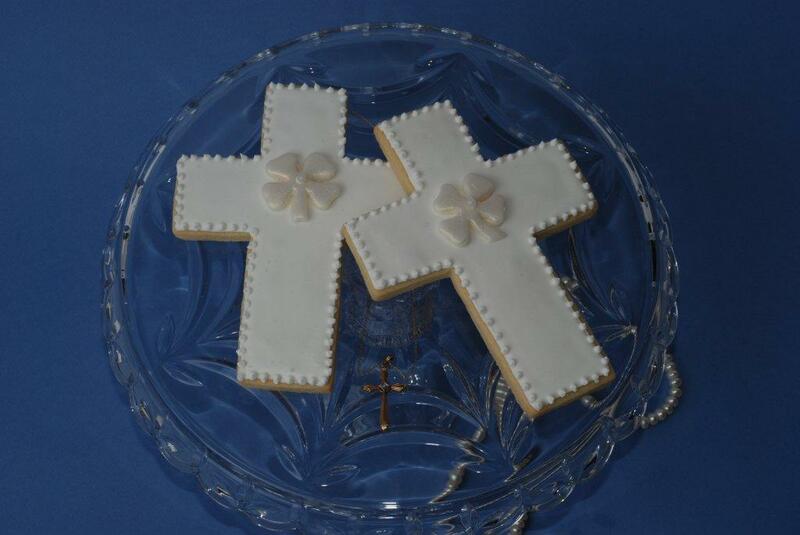 The most popular mediums to embellish the basic cookie are royal icing or fondant. 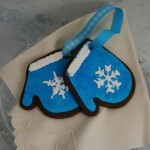 This post will focus on royal icing. 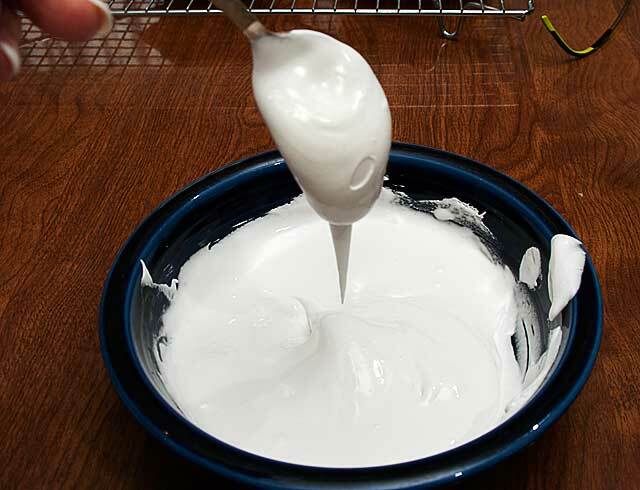 Royal icing consists of powdered sugar, egg whites and or meringue powder and water. 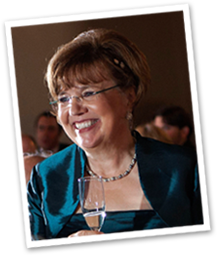 There are many opinions regarding the use of egg whites or meringue powder. Personally, erring on the food safety side, I prefer meringue powder. 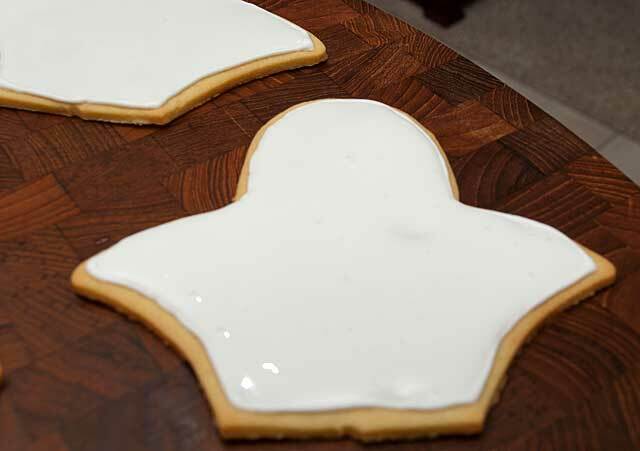 When preparing the royal icing, three consistencies will cover the basic decorating needs. First, you need a thick “glue” like consistency. Additionally, you need an outlining and flooding consistency. 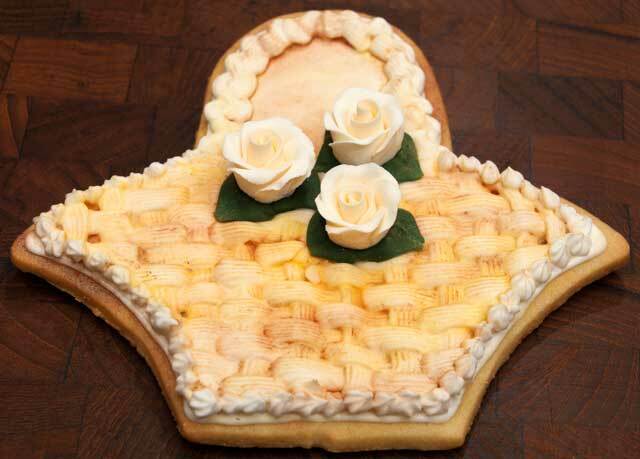 Using my May Day basket cookie, I will demonstrate a few basic techniques. In the bowl of a stand mixer, combine 1 pound of powdered sugar, ¼ tsp. 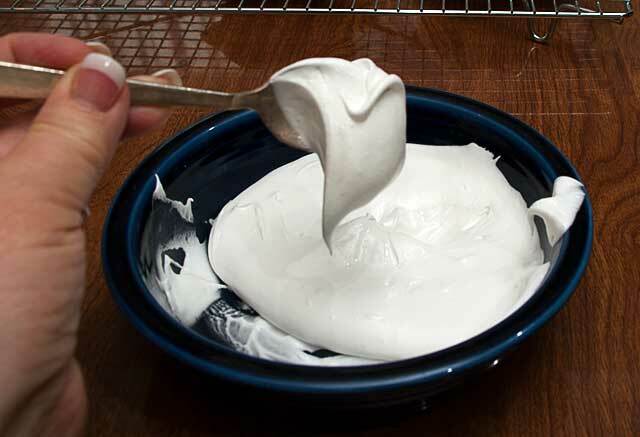 of cream of tartar, 8 tablespoons of meringue powder and 8 tablespoons of water. Using the whip attachment beat the ingredients for 2 to 3 minutes, until thick. You will know if the consistency is right if it sticks to a spoon without falling off. In two separate bowls place 1 cup of the above mixture. To the first bowl add ½ teaspoon of water. Stir the mixture well. You will see below that the mixture is looser and falling from the spoon in one lump. This is the consistency needed for outlining. 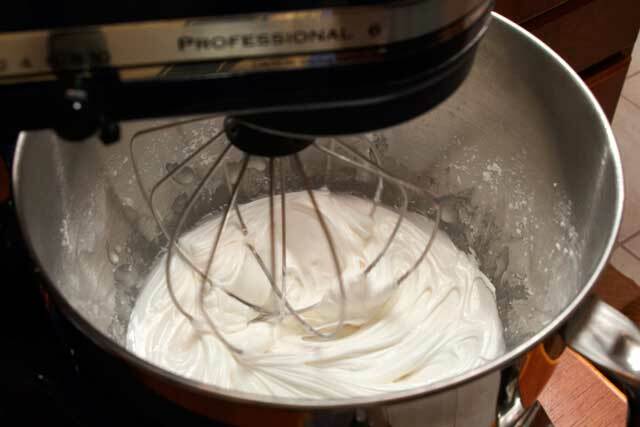 If the mixture is too thick to easily flow through a #2 Wilton tip, add ¼ teaspoon of additional water. Continue to adjust, if necessary, by adding 1/4 teaspoon of water at a time. 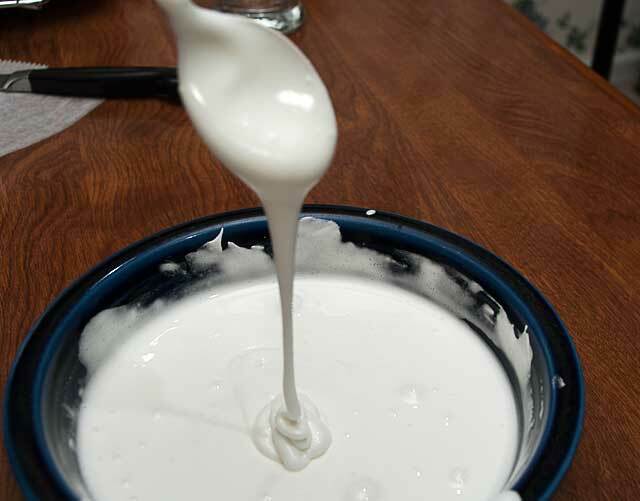 For flooding purposes, add 2-3 teaspoons of water to the original glue like consistency. Begin with the smaller amount. If you are using food coloring, start with 1 1/2 teaspoons of water. The end result should drizzle off a spoon. I like to use petal dust to paint and or shade my cookies. 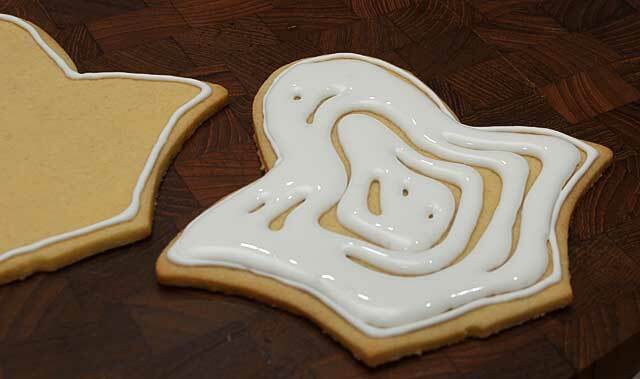 Therefore, I outlined and flooded the cookie using the white royal icing. 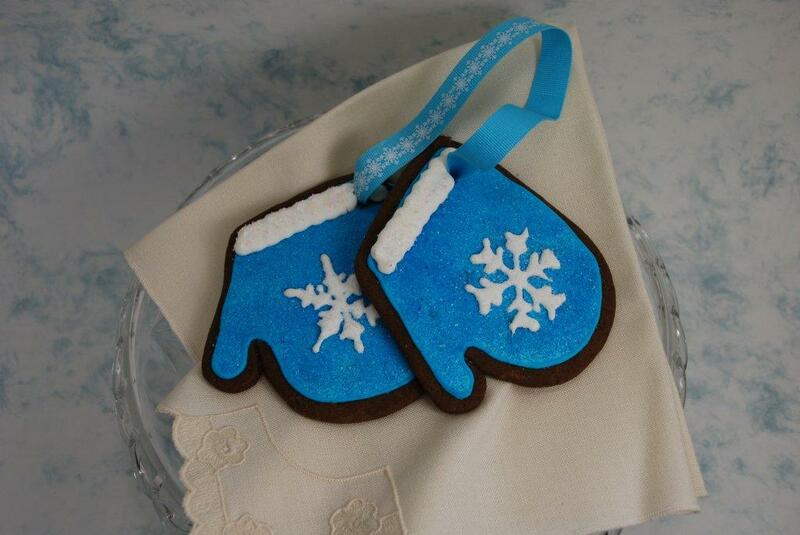 To begin fill a piping bag with the “outlining” royal icing and a #2 Wilton tip. The size of the tip opening will vary depending on the size of the cookie. 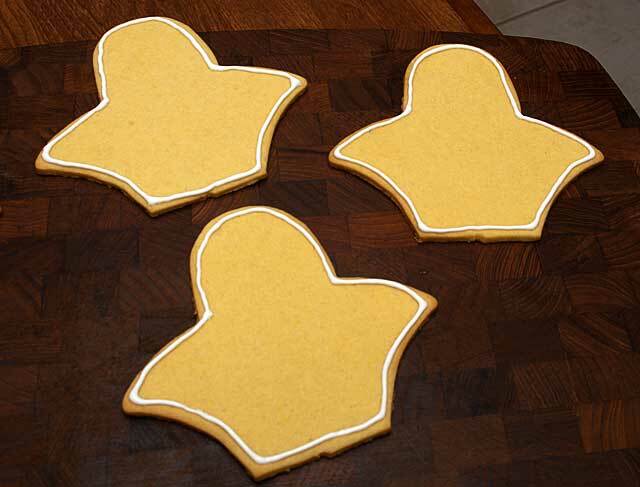 With a steady hand, outline the cookie’s edges. 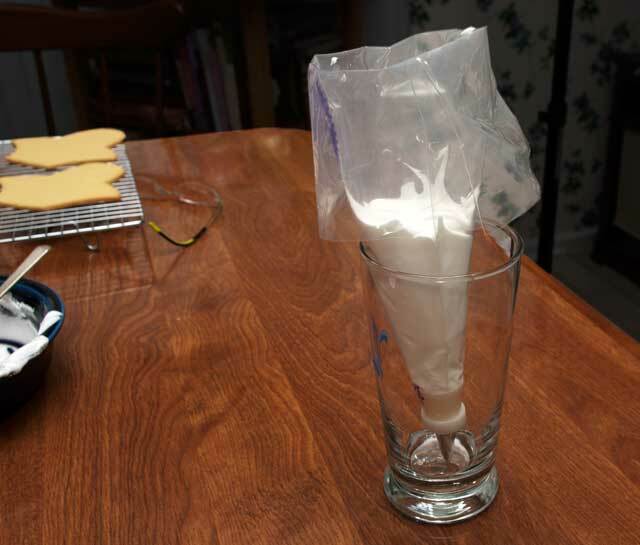 Next, place the “flooding” royal icing in a plastic squeeze bottle with a screw on cap. The tip has a 1/8” or smaller opening. Squeeze the icing onto the cookie in concentric circles. Spread together with a toothpick or small paint brush. Next, pipe a basket weave pattern on the basket. I used the #46 Wilton tip. Again the tip size depends on the size of the cookie. For step by step instructions watch this video. 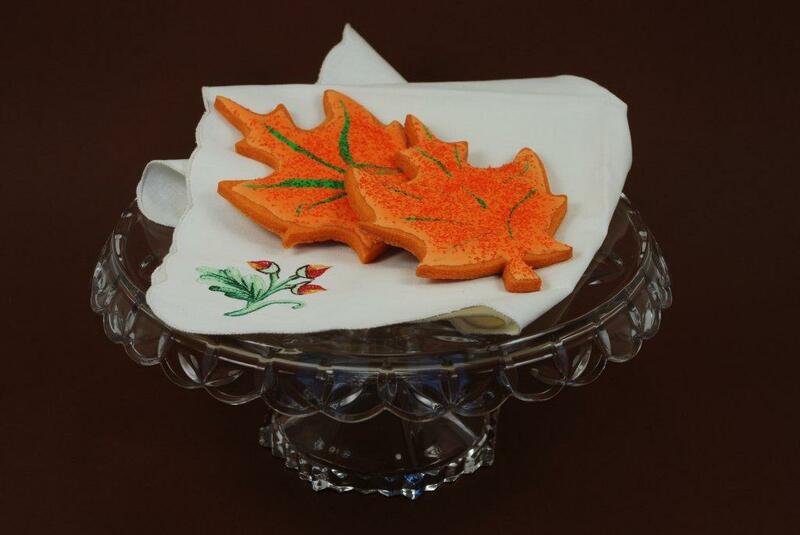 When the royal icing was completely dry, I shaded the cookie with a sable paint brush dipped in Buttercup petal dust and Spanish Moss Luster Dust. Finally, using the “glue” consistency, I embellished the basket with royal icing flowers. Here are some other cookie images that I made when catering. In the bowl of a stand mixer, using the whip attachment, add all four ingredients. Whip until thick, about 2-3 minutes.